February is Black History Month here in the USA. Every year we honor a lot of fine men and women and each year I hear new stories that are exciting and inspirational. We don’t often hear about blacks in the history of comics though, that art form near and dear to you and I. It looks like there has been some great blogging already this month, though. The Women In Comics wiki is celebrating as they do best – by listing useful information! Over here at TRO, I wanted to throw the spotlight on the favorite comics of my youth, those produced by Milestone Media. Milestone was launched in 1992 by Dwayne McDuffie, Denys Cowan, Derek Dingle and Michael Davis. They created an entire line of new comics, some of the best books and characters of the nineties. Those included Static, Hardware, and Icon. I’ve previously mentioned Hardware in my essay about How I Got Into Comics. From the get go, Milestone’s founders had the commendable goal of drastically increasing diversity in the superhero genre. They realized, quite correctly, that they couldn’t just launch one character – even if it was for a major publisher. They needed to do some serious world-building. There needed to be a fresh start, a place where there wasn’t already an extensive history of all white teams prancing around for decades. Over their six years they produced Hardware, Blood Syndicate, Icon, Static, Shadow Cabinet, Xombi, Kobalt, Heroes, Deathwish, Holocaust, Static Shock, and Wise Son plus the Shadow War, Long Hot Summer, and DC Universe slamming Worlds Collide crossovers. In an era plagued by endless “number 1” debuts and terrible delays between issues, Milestone pumped out about 250 issues between their titles, with Hardware running to an impressive 50. Milestone was successful. Maybe not making millions – the company suffered from the market oversaturation and eventual overall downtrend. But they’re still alive today, albeit as a licensing entity. But I say they were successful because they had an impact. On me, on many readers, on the careers of many talented young women and men, and on the bottom line. The comics were good and the comics sold. They didn’t settle for just creating black superheroes. They didn’t settle for telling the same old stories or falling into the “dark age” trap of over-gritty new anti-heroes. Titles like Static were amazing, both for their ability to talk to young African-Americans, but the ability to compete in the mainstream and be thoroughly enjoyed by any kid. The Milestone books were the favorites of my youth and the first I hunted down in the back issue bins. I was a Jewish kid with family from the Bronx. There were certainly plenty of us shmucks from the Bronx in comics history, but it wasn’t apparent when my young eyes gazed upon the racks. Seeing Static there… well, it just spoke to me more than anything else. I don’t think it’s that weird – black history is human history. Black stories are human stories. It’s the creators who have struggled with blacks as “the other” that end up with such strange output. Those that understand how simple it really is end up telling some amazing stories. Those at Milestone – those of all races and backgrounds, as it certainly wasn’t a mono-ethnic operation – understood how simple and complex it all is. And they understood how to make some damn good comics. No post at this website would be complete without some discussion of collected editions. I’ve updated the Milestone Reading Order tag with information and a header image. I went through and fully tagged the characters and creators on each book, adding cover images as I went. While it seems that DC has missed the opportunity to give us a new Milestone collection this year, I am pleased that they’ve recently made some significant progress in collecting these important and entertaining works. It was probably because of the Milestone characters interacting with the JLA and getting their own prestige release, but hopefully it’s the start of a trend. I assume, crass though it may be, that everything is based on sales – so if you like these comics or ideas, buy the books! Sales for Hardware Vol. 1 will inspire the publication of Hardware Vol. 2. Hardware: The Man In The Machine (Amazon) collects issues 1-8 of his title. The book introduces Curt Metcalf, smart as all hell, currently a cog in the system. When he finds out his employer isn’t on the up and up, he decides to fight back. A simplistic synopsis for a complex and sometimes disturbing book. 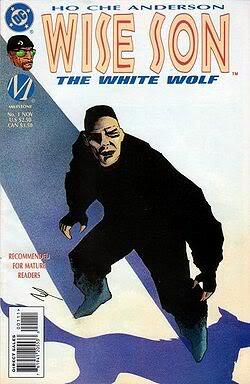 Written by Dwayne McDuffie, the story is brought to life by Denys Cowan‘s amazing art. Even the coloring is beautiful and different. Like all the starting trades, it can be read entirely on its own. The first four issues of Static‘s ongoing were collected previously in Static Shock: Trial By Fire but they are collected again here in Static Shock: Rebirth of the Cool (Amazon). This time, they’re accompanied by the 2001 Static Shock miniseries. McDuffie is joined on this book by Robert L. Washington III and John Paul Leon, among others. The gap between the two titles is a little confusing, but it makes for a thick trade with great value. It’s a quick way to introduce yourself to this wonderful nod to Spider-Man and classic super-heroics, with plenty of new twists. Static later ends up in the Teen Titans, starting in Teen Titans: Changing Of The Guard. The first Icon book, Icon: A Hero’s Welcome (Amazon) must have had solid enough sales, because we’re lucky enough to have a second volume already, Icon: Mothership Connection (Amazon). The first trade collects issues 1-8, while the second jumps around a bit more, pulling in Icon 13, 17, 19-22, 24-26, and 30. Dwayne McDuffie also helmed this title, working with artists M.D. Bright and Mike Gustovich. This book, like the others, twists a classic premise. Here, that alien shuttle landed in the hands of a black slave. Augustus Freeman, conservative lawyer, is the result – until young Rocket discovers his secret and convinces him to use his powers for good. Icon makes for one unique title, exploring black super-heroics through an alien who isn’t really black – but who experienced slavery first hand. 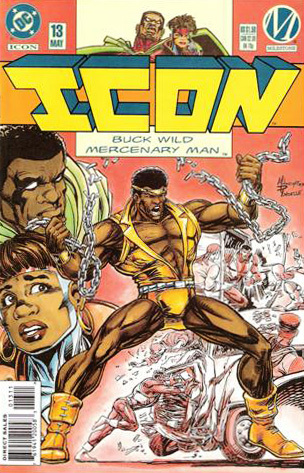 Also of note are the adventures in the second volume introducing Buck Wild, a Luke Cage-style parody character with unexpected depth of his own, used to play with common tropes about African Americans in comics. The Milestone characters have experienced a recent resurgence in the pages of primary DC Universe comics. Static had a story in 9-11 Vol. 2 and joined the Teen Titans. Other characters were re-introduced in a McDuffie penned JLA arc, the center of a set of Brave and the Bold issues, and received an ad-free showing in two prestige Milestone Forever format releases. We are now being treated to a new ongoing for Milestone’s Xombi, which might net us some classic editions if it sells well. I can’t tell you how excited I am to see these guys back. The world is a better place with them around. Ian, this was one pleasent surprise to find on the front page of TRO. You have continued to prove time and time again that TRO is a credible site and a great community for everyone. With respectful and educational pieces like this you continue to show the diversity of this group and I applaud you for putting this up. I haven’t much experience with the titles mentioned above. I must admit that one of my favorite things about the recent Blue Bettle trades were their showcasing and celebrating the diversity with having such a focus on the latino community. Thanks for the great recommendations and the great post. It’s almost a shame that there are few enough books out collecting these characters, making it relatively easy to feature them all in one post. A very interesting piece and well timed. Racism here in England occurs far less often than it appears to happen in the states, for that I am glad. The only racism I have ever encountered is the rising racism comments about people who looks “Muslim”, as there are far fewer black people in the UK. The racism I encountered was foul and I’d hate to be in the states seeing it all the more often. I have yet to try out Milestone but I know how big of a fan of them you are and I shall take your recommendation at some point in the future. I think the story in the 9/11 volume deals with anti-Muslim violence, actually. I haven’t picked up a copy of that book yet, though it’s high on my list once I start buying again. God, I hope these come out more in trade…it is damn near impossible to put together complete runs. I’m missing scattered late-Milestone issues (usually random mini-series issues, like Holocaust or Wise Son)…I even managed to put together a complete set of the trading cards, but hit a brick wall with the issues eventually. Haven’t looked lately, but should. I was very, very disappointed in the fold-in to the DCU and was very, very, very disappointed with Milestone Forever. 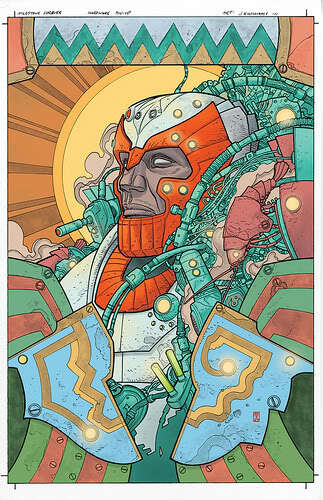 On the other hand, I’m thrilled Xombi is coming back – easily my favorite. Icon and Static were great…Hardware and Shadow Cabinet were good…Blood Syndicate just wasn’t for me. And I can’t even remember Kobalt. Sigh. Time to pull out the longboxes. Hey, do me a favor and don’t do a “New Universe Month” or “Ultraverse Month” because I don’t want to have to go dig up those, too. Honestly, I wasn’t as enamored with those titles (never saw em as a kid) so I don’t necessarily see it happening. I might start doing character spotlights, though, with recommendations on important trades and good starting points. But that’s down the line, just another idea bumping around in the old noggin.